If you want a task to end on a particular day, set a finish date for the task. Right-click a task, click Information > Advanced tab. Next to Constraint type, click Must Finish On. 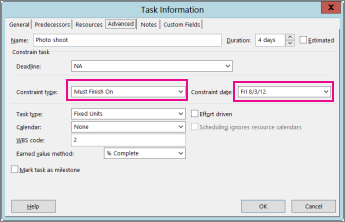 Next to Constraint date, fill in your end date. 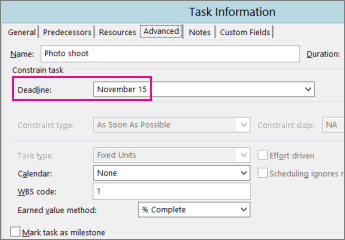 Tip: To set the finish date back to its original setting, change the Constraint type to As Soon As Possible. Keep in mind that setting the finish date can lock up your schedule in ways you don’t want. If you just need a reminder, use the Deadlinebox instead. That will create an arrow on the Gantt chart and an indicator in the Indicator column that changes color when the deadline is passed. Next to Deadline,fill in your deadline date. Learn other ways to control the dates in your schedule.